If you see performance issues with the guest operating system or applications running on the VM (for example, if the VM guest OS CPU or RAM usage exceeds 75% for extended periods of time), the VM may not have adequate system resources. Performance for a VM with resource constraints can often be improved by adding resources to the VM. 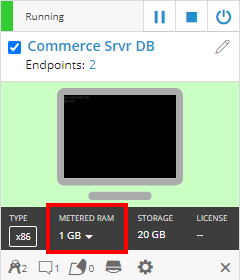 The amount of CPU and RAM allocated to the VM are displayed on the VM tile (visible from the Environment Details page or a sharing portal page. Select Task Manager from the pop-up menu. The Task Manager displays. In the Task Manager, click the Performance tab. Click System Monitor. The System Monitor opens. In the System Monitor, click the Resources tab. Leave the system monitor application running, and let the VM run at ‘idle’ for a few moments. The monitoring application should have graphs showing a history of resource consumption. Monitor the graphs as the VM idles. 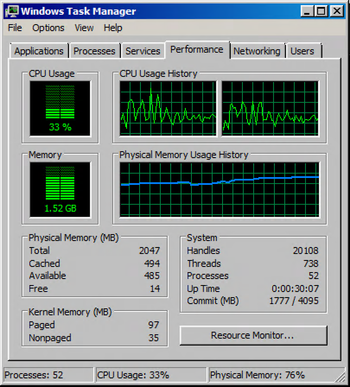 Note the percentage of CPU and RAM consumption while the VM is idling. 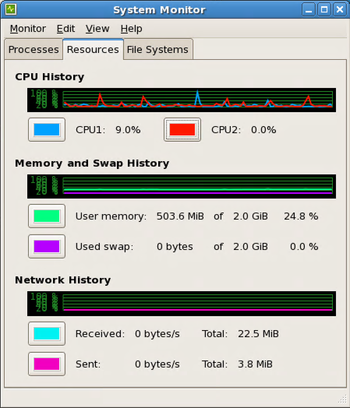 As an example, consider the following Red Hat instance with 2 CPUs and 2 GB RAM at idle; this VM is consuming only 9% of one CPU, and 24.8% of its available RAM. This VM should not be exhibiting any noticeable performance degradation. Leave the system monitor application running in the background, and perform some normal tasks in the VM. Click the Processes tab in the system monitor application. Use the column headers to sort the list by resource use. 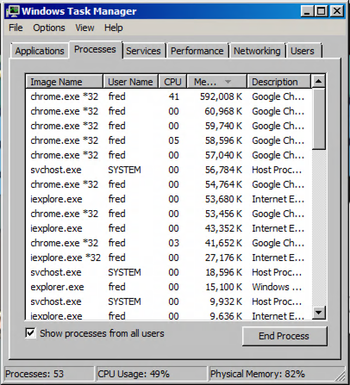 In the Windows example below, sorting by Memory shows that Google Chrome is using most of the RAM in the VM. Close or disable the processes or applications that are consuming the most resources. For example, in the scenario above, closing some tabs in Google Chrome might help. Verify that VMware Tools is updated to the current Skytap-supported version. VMware Tools provides the video driver that the VM uses. Check that the VM Guest OS attribute matches the operating system installed on the VM. For instructions, see Overview of VM hardware and guest OS settings. Increase CPU and RAM capacity. For instructions, see Overview of VM hardware and guest OS settings. Each SVM includes both 1 CPU core and 1 GB of RAM. If you choose to increase the capacity of the VM, remember to add both RAM and CPU cores at the same time. For Windows VMs, verify that the video driver is up-to-date. Right-click on My Computer, and click Properties. In the System window, click Device Manager. Expand Display Adapters to see the current driver. If the driver listed is not VMware SVGA 3D (Microsoft Corporation - WDDM) follow the instructions below to update it. If the driver listed is the WDDM 3D driver, make sure you are using the most recent version. Right-click the current driver, and click the Properties. Check the Driver Date on the Driver tab. Make sure to use the WDDM 3D driver from 7/28/2011 (older versions do not provide as much video RAM). Right-click the current driver, and click Update Driver Software. Reduce color depth on the VM. The steps differ depending on the VM guest OS. Right-click anywhere on the desktop select Personalize. Click Display in the lower left-hand corner. Click Adjust Resolution in the upper left-hand corner. Then, click the Advanced Settings link. On the pop-up window, click the Monitor tab. Under Colors choose High Color (16 bit) and click OK. Remove the screen background pictures and use a solid color for the VM desktop background. The steps differ depending on the VM guest OS. Click the Desktop Background button in the lower left-hand corner. Make sure Picture Location is set to Solid Colors and click Save Changes. Clear the browser cache. Try connecting to the same virtual machine from a different browser (see Access requirements). If you do not experience the same performance degradation in both browsers, you may need to clear the cache in the original browser. For instructions, see http://www.wikihow.com/Clear-Your-Browser’s-Cache. Set the browser zoom level to 100%. If you still experience connectivity or performance issues after checking the above settings, check the Internet connection speed to Skytap. For instructions, see Testing bandwidth with Skytap Speedtest.